Excavator TL/VIP Bucket Teeth for KOBELCO. It can be used in frost, rock or hardpan conditions. The life of span of the tooth is shortened. The logo of product, there are 3 ways you can choose. The first is no logo. The second is using our logo "ST". The third is that you send me your logo, then make it. And if the products are destroied in our warranty, we can send the new to you. In general, our products are in high quality, there is no problem about it. 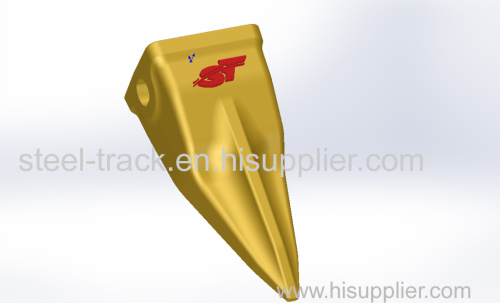 Steel Track company has more than 10 years experience in making track shoe and bucket teeth, even though the company only has been founded 2 years. Our company is near by Ningbo Port. So it is convenient to ship products out. We also sell track links, cutting edge and other undercarriage parts, like idlers, carrier rollers and so on. we can give you the best prices. Maybe we can be the work partners. Thanks!